I'm excitied to announce a new mail art call that brings together two places that I call home. At each venue I will be showing your mail art for a week . 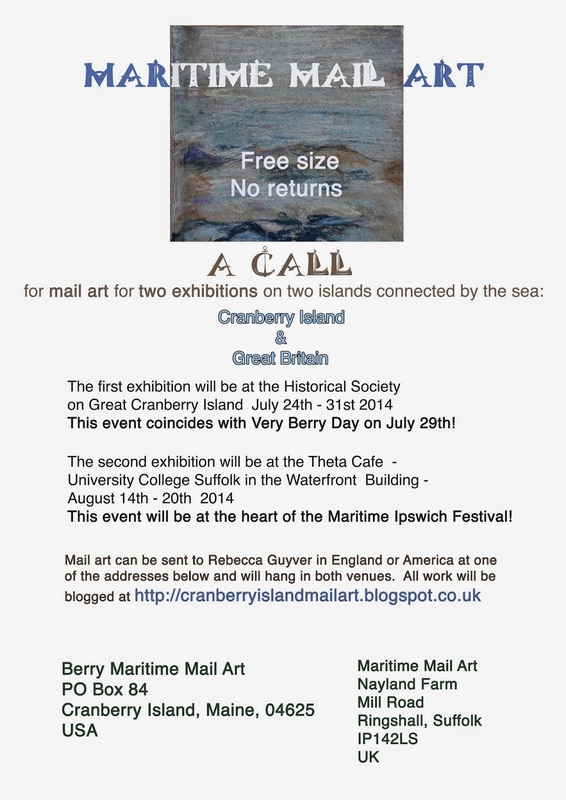 The first exhibition will be on Cranberry Island and the second exhibition will be during the Maritime Ipswich event at a cafe that is part of University College Suffolk, right on the waterfront where all the maritime action takes place! I will show all work submitted in both venues- free size, no fee, no sales, no returns. Please label you entries with name and address so I can notify you that they have arrived! But please be patient, I can only be in one place at a time and mail art may be waiting for me at the other address! I look forward to your entries and will be publishing an online catalog at the end of the second exhibit. Visit http://cranberryislandmailart.blogspot.co.uk to see the work as it arrives!